10761 18oz. * 12/case 049542107617 18 lbs. 10763 22oz. ** 12/case 049542107631 21 lbs. Refill 4/case 049542107648 36 lbs. 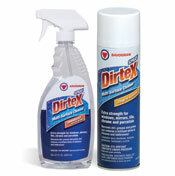 The same Dirtex® power in a quick dissolving powder. Powdered Dirtex® is an excellent general-purpose household cleaner for all washable surfaces, but is gentle to hands and skin. It leaves surfaces clean without rinsing or streaking to save time. 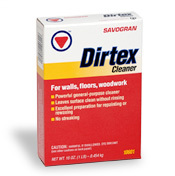 Powdered Dirtex® is ideal for cleaning walls and woodwork before repainting or rewaxing. 10601 1 lb. 12/case 049542106016 13 lbs. 10602 4.5 lbs. 8/case 049542106023 38 lbs. 10603 25 lbs. Pail 049542106030 26 lbs. 11605 100 lbs. Drum 049542116053 105 lbs. An excellent paintbrush or roller cleaner that dissolves hardened oil or latex paint, varnish, lacquer and shellac from natural or nylon bristles. 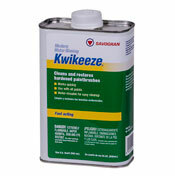 Kwikeeze® contains a water-rinsing detergent that quickly cleans wet oil paints from brushes and rollers between coats (not recommended for wet latex paint). Clear used liquid can be poured off and reused. Extremely Flammable. DCM free. Multi-purpose solvent VOC compliant. 01272 Quart 6/case 049542012720 12 lbs. A concentrated product specifically formulated to clean dirt and grime from exterior surfaces. Recommended for cleaning painted wood, metal, vinyl, stucco and aluminum siding. The product can be applied by hand or with a pressure washer. House Wash is a concentrated product—One gallon of cleaner will make up to 16 gallons of cleaning solution and clean approximately 6400 square feet. Mildew stains can be removed with the addition of bleach. 10643 Gallon 4/case 049542106436 37 lbs. A heavy bodied phosphate-free cleaner that dissolves and removes grease and oil from asphalt and concrete surfaces. Excellent for cleaning driveways and garage or basement floors before sealing or painting. 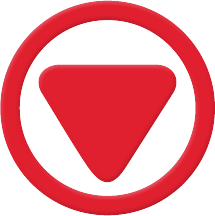 Also great for degreasing machinery, small engines, and parts, outdoor equipment and tools. 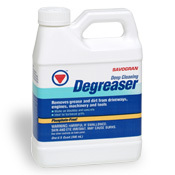 Degreaser contains Bitrex® to hinder accidental swallowing by children. 10732 Quart 6/case 049542107327 14 lbs. 10733 Gallon 4/case 049542107334 36 lbs. 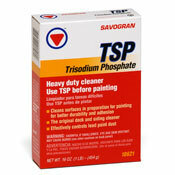 A non-sudsing powdered Trisodium Phosphate compound that is formulated for heavy duty cleaning. Preferred by painting and cleaning professionals for removing heavy deposits of greasy grime, smoke, soot stains and chalked paint from walls, woodwork and floors. Removes mildew and mildew stains when mixed with bleach. Also recommended for washing away paint remover sludge. 10621 1 lb. 12/case 049542106214 13 lbs. 10622 4.5 lbs. 8/case 049542106221 40 lbs. 10623 25 lbs. Pail 049542106238 27 lbs. 11625 100 lbs. Drum 049542116251 106 lbs. A heavy duty cleaner with the equivalent cleaning power of TSP for use where phosphate cleaners are prohibited. The phosphate-free formula also removes heavy deposits of greasy grime, smoke, soot stains and chalked paint from walls, woodwork and floors. Cleans remover sludge and restores weathered and mildewed decks and siding. 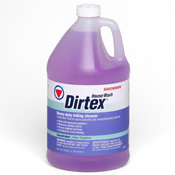 Removes mildew and mildew stains when mixed with bleach. 10611 1 lb. 12/case 049542106115 13 lbs. 10612 4.5 lbs. 8/case 049542106122 38 lbs. 10613 25 lbs. Pail 049542106139 26 lbs. 11615 100 lbs. Drum 049542116152 105 lbs. A heavy duty all-purpose cleaner that cuts through heavy deposits of greasy dirt and grime from interior and exterior surfaces. 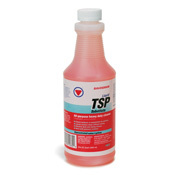 TSP is a concentrated product—one gallon of TSP will make up to 16 gallons of cleaning solution. Recommended for cleaning walls, woodwork, ceilings, concrete, metal, vinyl and aluminum siding. 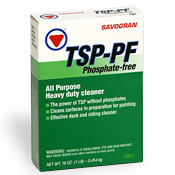 TSP phosphate-free cleaner requires no rinsing. Removes mildew stains when mixed with bleach. Apply by hand or with a pressure washer. 10632 Quart 6/case 049542106320 14 lbs. 10633 Gallon 4/case 049542106337 37 lbs. 10634 5 Gal. Drum 049542106344 45 lbs. 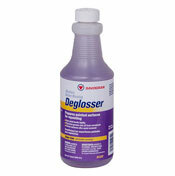 Deglosser cleans oil, grease and paint remover sludge from wood and metal, and heel marks, dirt and pencil marks from new wood. It etches high-gloss enamel, varnish and marine paint finishes to improve bonding of new finishes. Eliminates sanding prior to recoating. Great for walls, ceilings, doors, woodwork and floors. DCM free. Multi-purpose solvent VOC compliant. 01282 Quart 6/case 049542012829 14 lbs. 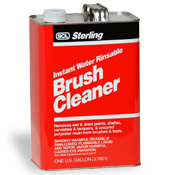 A water rinsable brush cleaner for removing dried paints, shellacs, varnishes and lacquers from natural and nylon bristle brushes, restoring them to “like new” condition. Not for use on synthetic brushes other than nylon. Flammable. 050804 Quart 6/case 082069292046 13 lbs. 050801 Gallon 4/case 082069292015 33 lbs.